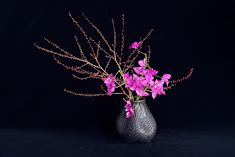 Let’s consider the relationship between art and Ikebana. More specifically, did Ikebana really become a form of Western art during the Ikebana boom after the war? We need to review briefly the historical background to answer this question. After the Meiji restoration, the concept of fine art was introduced to Japan. Some Ikebana artists tried to develop Ikebana into an art form. Note that there was a general trend to Westernize Japanese culture and society at that time. This trend became even more prominent after the war. The transformation of Ikebana into art was supported by a great many people and resulted in the great Ikebana boom. As I mentioned before, this phenomenon is a really interesting case study in cultural transformation. Changes in Ikebana reflect the changes in Japanese society and culture including spiritual orientations. Before discussing further about the relationship between Ikebana and art, we need to clearly define Ikebana and art in this context. First, what is Ikebana? There are many definitions of Ikebana but most of them seem to be too personal or too abstract to be useful for critical thinking. I may need to present my own definition to be able to move forward. I’ll talk about what Ikebana is from the next issue. This month I would like to show my work for the office opening event of Olympus Australia in February 2014. It was a great cultural event with many renowned Japanese artists and performers invited to entertain. With beautiful golden screen at the back, my work has to be strong.